Historically, native plants covered our land. Pioneers described the expansive rolling prairie as a sea of grass through which they navigated their prairie schooners. An early explorer in the Ozarks, Henry Rowe Schoolcraft, described the savannas found there as "a tall, thick and rank growth of wild grass...in which the oaks are standing interspersed like fruit trees in some well cultivated orchard, and giving the scenery the most novel, pleasing and picturesque appearance." Glades were also encountered where bedrock reached the soil surface. Lewis and Clark would have witnessed many wetland ecosystems as they journeyed up the Missouri River. These native plant communities have changed dramatically since the first European explorers described them. Yet, they can be restored. The native plants associated with the ecosystems can be reestablished, and this can provide habitat for species of wildlife that are obligate to the ecosystems. Each ecosystem has a unique array of plants associated with it. 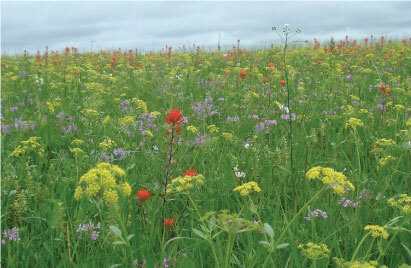 Some plants may inhabit more than one habitat, but others may be obligates of specific ecosystems. Pale purple coneflower , for example can be found growing on glades, savannas, and prairies while its close relative, Yellow Coneflower, is found only on the driest sites, the glades. Because many of our native ecosystems are endangered, so are the plants that are associated with them. By recreating or restoring these ecosystems, the plant species allied with them are also protected. Native ecosystems once lent shelter to abundant populations of wildlife ranging from the large mammals to the smaller mammals, amphibians, and insects. Today, some of these animals still roam across the countryside, but some, such as the bison and elk are a memory of yesteryear. Some species of wildlife depend on certain ecosystems; for example, glades are the much preferred habitat of the Eastern Collared Lizard, Lichen Grasshopper, and Greater Roadrunner. Restoring our imperiled native plant communities is a great way to create habitat for species of wildlife that are adapted to the ecosystems. Native pollinator populations are also in serious decline. Native pollinators are adapted to native plants; in some cases a plant or a pollinator may be so dependent on the other that th ey cannot exist independently. Planting a diverse pallet of natives is a great way to provide necessary habitat requirements for pollinators. Getting rid of existing vegetation and seeds in the soil is usually the most important step to ensure a successful wildflower planting from seed. For more information check out our planting timeline. Wildflower seeds need to go through a cold, moist period before they will germinate; so plant in winter or see our stratification guide. New construction sites and steep slopes are considered critical areas. See special instructions for these areas in our critical area treatment. Visit our guides page for more tips and solutions.